Let your teachers know that they are stars in your eyes! This file has three versions of a customizable movie star-theme certificate for related teacher appreciation activities. 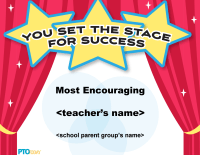 Add your parent group's name, an individual teacher's name, and what star quality they are being recognized for. 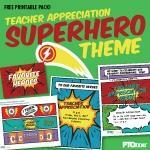 Make your school's teachers feel like the heroes they are by planning a superheroes-theme event. 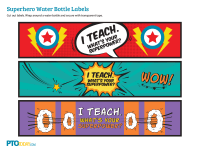 Use these water bottle labels along with our superheroes-theme announcement, invitation, "I teach. What's your superpower?" poster, table tent/cards, iron-on transfers, and photo booth props to plan a special Teacher Appreciation Week (or any time of the year) event. Make your school's teachers feel like the heroes they are by planning a superheroes-theme event. Use these table tents (which can also be used as cards) along with our superheroes-theme announcement, invitation, "I teach. What's your superpower?" 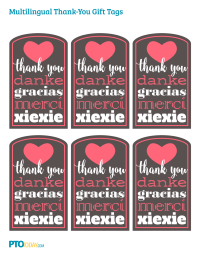 poster, photo booth props, iron-on transfers, and water bottle labels to plan a special Teacher Appreciation Week (or any time of the year) event. Make your school's teachers feel like the heroes they are by planning a superheroes-theme event. Use this poster ("I teach. What's your superpower?") 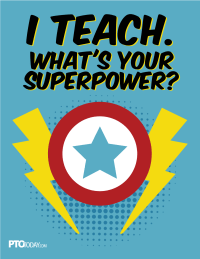 along with our superheroes-theme announcement, invitation, photo booth props, table tent/cards, iron-on transfers, and water bottle labels to plan a special Teacher Appreciation Week (or any time of the year) event. Make your school's teachers feel like the heroes they are by planning a superheroes-theme event. 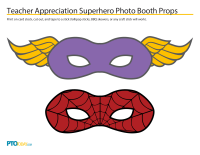 Use these photo booth props along with our superheroes-theme announcement, invitation, "I teach. What's your superpower?" poster, table tent/cards, iron-on transfers, and water bottle labels to plan a special Teacher Appreciation Week (or any time of the year) event. Make your school's teachers feel like the heroes they are by planning a superheroes-theme event. 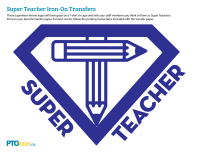 Use this "Super Teacher" iron-on transfer along with our superheroes-theme event announcement, invitation, photo booth props, "I teach. What's your superpower?" poster, table tent/cards, and water bottle labels to plan a special Teacher Appreciation Week (or any time of the year) event. Make your school's teachers feel like the heroes they are by planning a superheroes-theme event. 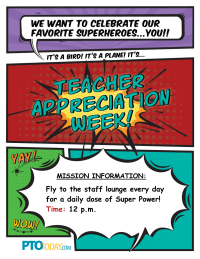 Use this customizable invitation along with our superheroes event announcement, photo booth props, "I teach. What's your superpower?" 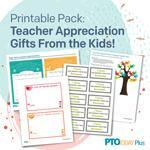 poster, table tent/cards, iron-on transfers, and water bottle labels to plan a special Teacher Appreciation Week (or any time of the year) event. Make your school's teachers feel like the heroes they are by planning a superheroes-theme event. 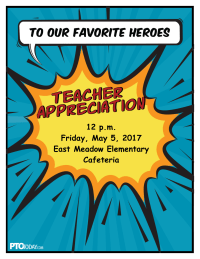 Use this announcement along with our superheroes event invitation, photo booth props, "I teach. What's your superpower?" poster, table tent/cards, iron-on transfers, and water bottle labels to plan a special Teacher Appreciation Week (or any time of the year) event. For a "souper" teacher! 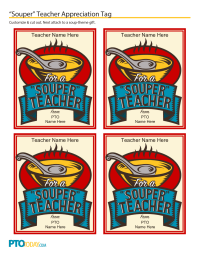 Customize these tags with a teacher's name and the name of your parent group, then attach to a soup-theme gift, such as a take-home container filled with homemade soup or chili. Four tags to a page. 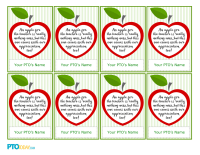 Cute tags with a sweet message to apples for teachers at back-to-school time. 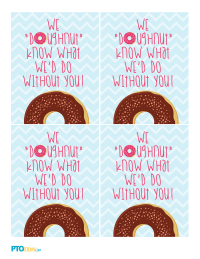 Cute gift tags to print and attach to doughnuts as a sweet Teacher Appreciation pick-me-up. 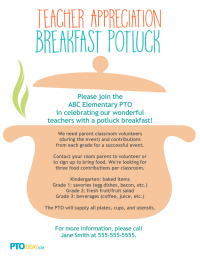 Customizable flyer to promote a breakfast potluck for Teacher Appreciation. Cute coupons kids can fill in with jobs (wiping down desks, sweeping, etc.) they can do to help the teacher. 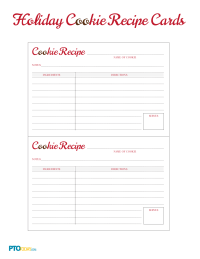 Blank cards to fill in with your favorite cookie recipe for a holiday cookie exchange. 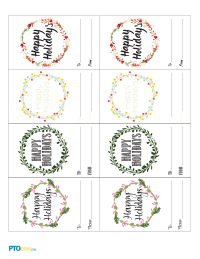 Pretty tags that say "Happy Holidays" to use for a holiday gift-wrapping service for teachers. Give teachers a break by covering them during lunch duty.